Braum’s Ice Cream and Dairy Store, is, as the name suggests, a chain of fast food restaurants selling ice cream but also sells other dishes. 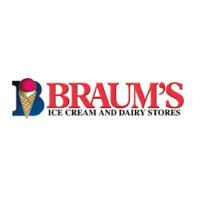 To find out how to apply for Braum’s Ice Cream and Dairy Store online follow the link below or use the information to start your Braum’s Ice Cream and Dairy Store application. The restaurants are named after the founder of the company, Bill Braum, who started the company back in 1968. All of the locations are within a 300 mile radius of Tuttle, Oklahoma where the family farm is located. There are nearly 300 restaurants in Oklahoma, Texas, Kansas, Arkansas and Missouri. The food sold in the restaurants is grown, produced and manufactured by the company itself, from farm to table. They have a dairy farm, processing plant and bakery in Oklahoma. The company also runs a number of grocery store brands of milk and ice cream products as well as cookies, breads and rolls. The restaurants have menus for breakfast, lunch and dinner, obviously with a sizeable dessert menu including a lot of ice cream. You’ll find banana splits, ice cream sundaes, malts, shakes, freezes and sodas. The ordinary menu has burgers, salads and chicken while the breakfast menu offers bagels, burritos and hotcakes. In the restaurants there will be some Braum’s Ice Cream and Dairy Store jobs that are entry-level and so you will only need minimal experience to apply for these jobs which are mostly Team Member positions. You will also be able to find job opportunities as Assistant Managers and General Managers for which you will need to have previous employment experience in a similar position. You can also apply online for Braum’s Ice Cream and Dairy Store jobs in the corporate side of the industry. You can send in applications for vacancies in the departments of Accounting and Finance, Administration, Human Resources, Information Technology, Marketing, Payroll, Print Shop and Purchasing. You will usually need to have a college degree for many of these roles. How old do you have to be to work at Braum’s Ice Cream and Dairy Store? You only need to be 16 years old or over to apply for jobs at Braum’s Ice Cream and Dairy Store. Your benefits in Braum’s Ice Cream and Dairy Store careers will vary depending on your position and how long you have been working there. Eligible employees will be able to access a benefits package including a healthcare insurance plan with medical, dental and vision insurance as well as 401(k) retirement plans. The stores open at 6am daily and close at 11pm Sunday to Thursday and 11.30pm on Fridays and Saturdays. Team Member – The most important part of being a Team Member is to be good at communicating with customers and to have an outgoing personality. Your responsibilities will include taking customer orders, putting together their food items and processing transactions. The expected pay for this role is from $6 to $9 an hour. Assistant Manager – In this role you will be expected to be able to run the store in the absence of the Manager. You will help to supervise staff and be responsible for some procedures including opening and closing processes and closing down the tills. The typical pay is between $11 to $12 an hour. General Manager – The job description of a General Manager requires you to have responsibility for the performance of the whole store. You will be responsible for hiring new members of staff and making sure they learn their new responsibilities. You will also have administrative duties and be responsible for scheduling. The expected salary is $31k/year. District Manager – District Managers will have an area under their purview and will need to ensure that all of the stores are performing to the expected standards. You may be involved in hiring and supervising members of staff as well as carrying out financial duties and ensuring sales targets are met. The salary is around $56k/year. Practice some common questions to give yourself an edge in your interview once you’ve submitted your Braum’s Ice Cream and Dairy Store application. Why do you want to work here? You should always have an answer prepared for this sort of question as it is likely to be the first thing you are asked. It helps to do some research on the company before you go. What do you know about the company history? You can’t go into an interview without reading up on the company history and culture. Doing research shows your enthusiasm and dedication to the role. What is your availability? It helps to have your availability worked out before you go and it will help your applications if you are able to be flexible in your scheduling as they may have specific shifts to fill. Do you have experience in the food service industry? It won’t always be necessary but it will definitely help your career prospects if you have worked in a similar role before or you’ve interacted with customers in your previous employment. Tell me about a time when you worked in a team. This doesn’t need to be a professional example if you don’t have one. You can use an example from a school or college team that went successfully. You can easily submit an Braum’s Ice Cream and Dairy Store job application online by browsing through the list of jobs by searching Braum’s Ice Cream and Dairy Store jobs online. The online application process is very straightforward, you will need to fill in your personal details and details of your previous employment and upload your resume. If you don’t want to apply online you can make a direct application to your local store by enquiring about their open positions in person and requesting a free application form. You can also download a printable application for Braum’s Ice Cream and Dairy Store. Make sure you’re well presented when you go in to make a good first impression. The application process for entry-level positions especially won’t normally take that long, it should only take a couple of weeks at most. The interview will consist of standard questions focusing on your experience and your personality. Management interviews will be more in-depth and you will need to prove your successful track record. Even if you expect the interview to be easy you should still dress smartly when you turn up, although you won’t need a full business suit. Remember to smile and be positive throughout and show that you are serious about the job. Answer their questions in complete sentences and give examples where you can. Auntie Anne’s: Checkout the application page for work at Auntie Anne’s. Einstein Bros. Bagels: Checkout the application page for work at Einstein Bros. Bagels. Tropical Smoothie: For employment at Tropical Smoothie visit the application page. Marble Slab Creamery: See this page for jobs at Marble Slab Creamery. Orange Leaf: For career opportunities, fill out the Orange Leaf online application.